The Kingdom of Bhutan is a sovereign State landlocked in the Eastern Himalayas in South Asia. Bhutan borders China to the north and India to the south, east and west. Dogs, as well as many other domesticated and wildlife species have an important cultural role in Bhutan. Rabies is endemic in countries in the region and Bhutan has maintained an extensive dog vaccination program so that cases of rabies are relatively infrequent and are mainly associated with seasonal cross-border movement of grazing herds and dogs. Fast and accurate laboratory diagnosis of suspected rabies cases assists in tracing disease origins and allocating resources for local area vaccinations to stamp out cases. 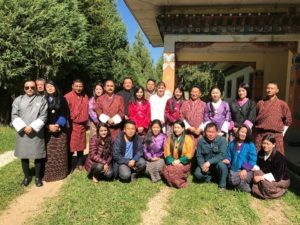 In October 2016, through the support of the Victorian Committee of the Crawford Fund, Ms Andrea Certoma and Dr John Allen of CSIRO’s Australian Animal Health Laboratory (AAHL) planned and conducted a training workshop for enhanced rabies diagnostics at the central animal health laboratory in the capital city of Thimphu. Twenty-one staff (pictured) received training and competency assessment in conducting rabies testing—using a cost-effective test that had been developed by AAHL. This test, called the Rabies Immunofluorescent Antigen Detection, or ‘RIAD’, has been developed for resource-constrained laboratories—that is, those laboratories that do not possess an expensive fluorescence microscope to conduct rabies testing with a high degree of accuracy. The RIAD training was conducted over 3 days and structured so that all participants were shown the principles of the test and the method to be followed. They were then able to perform their own tests on a small number of unknown samples to assess their competencies. 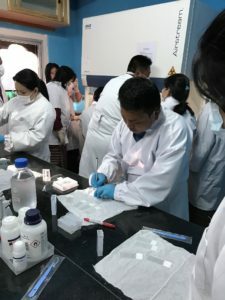 The implementation of this RIAD test in Thimphu not only enables a more cost-effective method for detecting rabies, but the three satellite laboratories will no longer need to send samples to the central animal health laboratory for analysis. This means that cases of suspect rabies in dogs can now be confirmed in quicker time and where needed, treatment with post (bite) exposure prophylaxis (PEP) can now be authorized and commenced without delay.